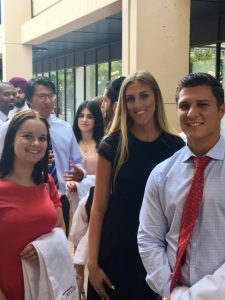 RSDM’s annual White Coat Ceremony does more than mark the start of dental school for first-year students. It transforms them into healthcare professionals. This year’s event, for the Class of 2022, was no exception. The tradition of distributing white coats has long been a ritual among medical students but in the past decade, dental schools have also been marking the milestone. RSDM was a pioneer in establishing the tradition. “We were one of the first dental schools in the country to hold such a prestigious ceremony,” Dean Cecile A. Feldman told the students. The white coat represents the responsibilities of the medical profession, and although RSDM students spend two years of pre-clinical training before treating patients, they are designated “student doctors” when dental school begins. After receiving their coats one-by-one, students were led by alumnus Dr.Anthony Volpe as they recited dental oath and RSDM code of honor before an audience of family members and friends. Also at the ceremony, the Student Professionalism Award was given to fourth-year students Jonathan Matute and Volha Bortnik.